In 2016, International Needs met ten year old Eric (waving in the photo) and his family. 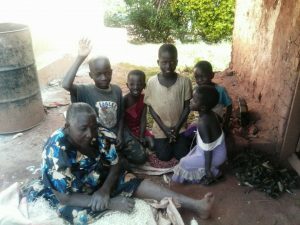 He lives in Buikwe District in Uganda. 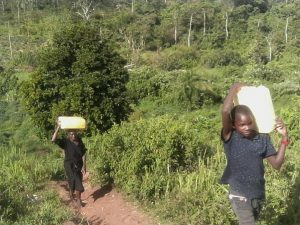 Every day before school he had to walk for two hours to collect water for his family. His parents passed away, so he lives with his Granny who cares for him and his siblings. She struggles to earn the money she needs to send them to school, feed them and provide them with basic resources. This leaves little time for her to collect water. The journey to the nearest water source took Eric an hour and involved a steep climb on his return. Despite the fact that there was water far down, under his feet, he still had to make this daily trek. 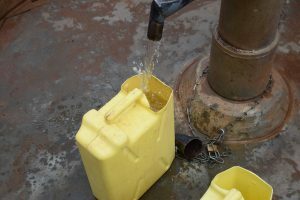 Eric’s family needs at least 5 jerrycans (total 100 litres) of water every day. He often had to wait in long queues to collect water as many people relied on the same water source as his family. With this long journey and big responsibility, Eric was often late to school and tired in lessons. But if Eric didn’t collect the water, then who would? In 2016, International Needs began a pilot Water Project in Eric’s community and a new borehole was sunk 50m from Eric’s house. It now takes Eric just 20 minutes to collect water each day. family did in the past. With your help we want to help over 30 villages over the next five years to relieve this burden.